Along with her china and her love for the pretty things in life, I inherited my extreme impatience from my maternal grandmother. I think it's my least favorite of all she left to me. Waiting eight months to see our little ones' faces -- excruciating! Waiting to meet our babies and bring them home -- awful! 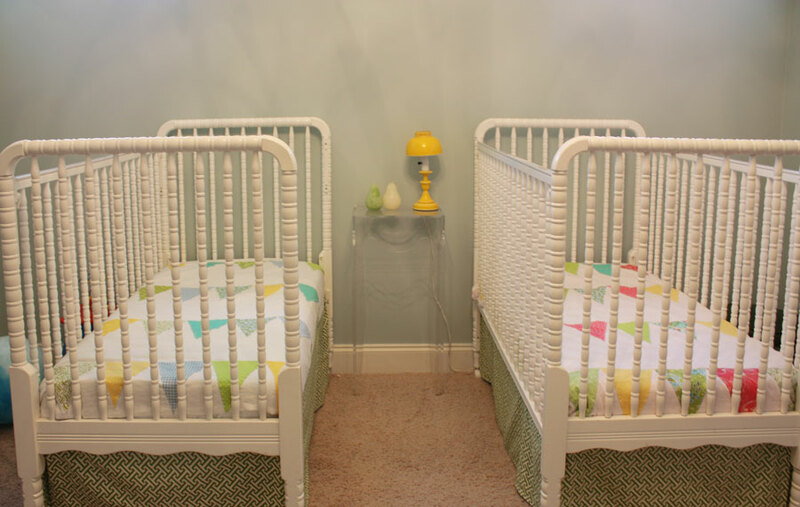 And waiting a year to put the finishing touches on the nursery -- well, it very nearly killed me! So as soon as we got our referral and found out for sure that we're anxiously awaiting the arrival of one little boy and one little girl, I headed to the fabric store. My babies needed crib bedding and they needed it yesterday! 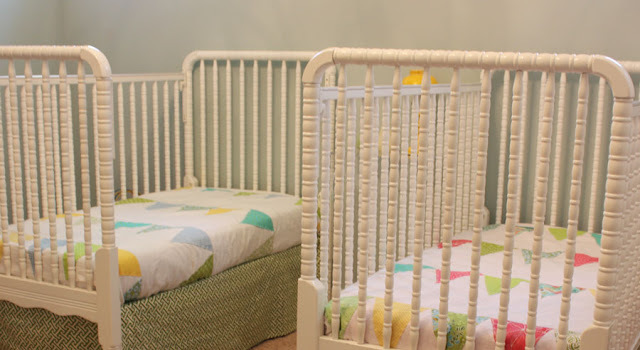 Because I know someone is going to ask -- one side is off of the crib on the left because my 2.5 year old niece sleeps there occasionally and likes to feel like she's in a big girl bed like at home. Luckily for me, my family's first annual week-long Christmas cabin getaway was coming up, and I knew I could exploit the sewing talents of my mom and sister. They were kind enough to not only help me make the big decisions (Pinked edges, or hemmed? White thread, or green?) but also to do quite a bit of the dirty work. I truly love the end results. Thanks, mom and Brooke! *white flannel cut to the size of your finished blanket (plus a few inches for hems) Mine was 36"x60" (4"
$12 and a throw blanket for $10. Thanks to mom for the great idea! personal thing. 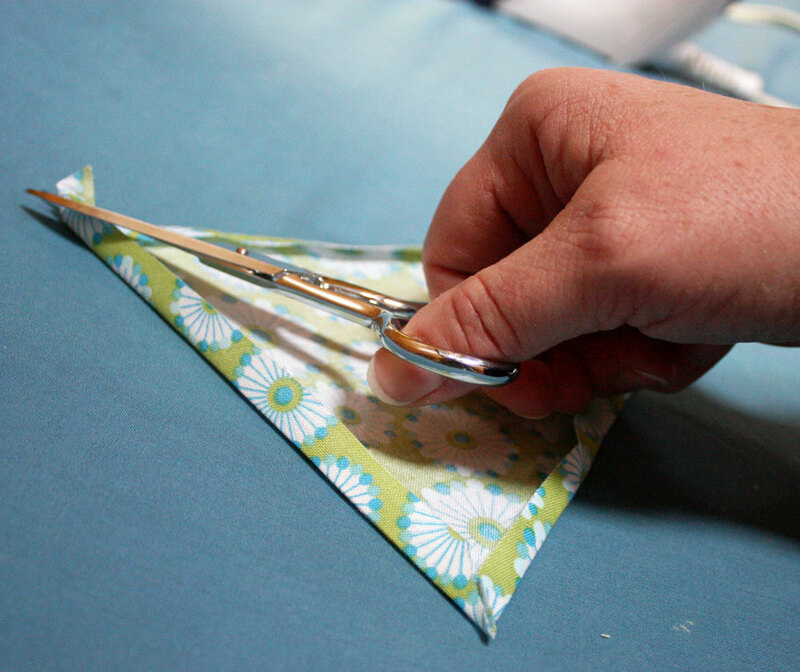 Tip - using a cutting mat and rotary cutter makes this step much easier. 3. Painstakingly iron under the edges of each triangle. Mom ironing and trimming while simultaneously posing for a photo for the blog - not an easy task. 4. Trim overlap in each corner of each triangle. pattern, but do what makes you happy. 6. Pin each triangle. It's easier if you pin one row at a time. 8. ......aaaaand repeat steps 6 & 7 until you've sewed all the triangles on. 10. Lay out your flannel top and your fleece backing - right sides together - and pin. 12. Turn it right-side-out, then turn under the edges of your hole and pin. Sew it up. to make the edges look neater, and to keep them lined up correctly. 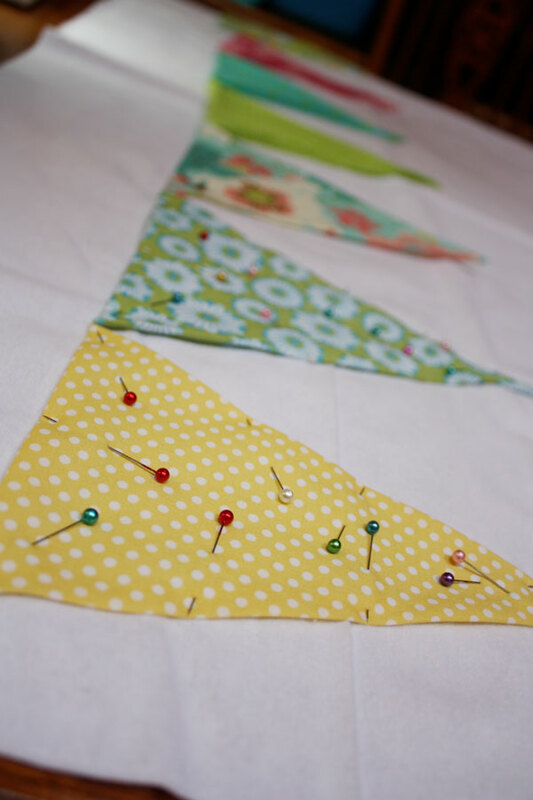 hand-stitching where a couple of the bunting triangles meet. Those are adorable!!! 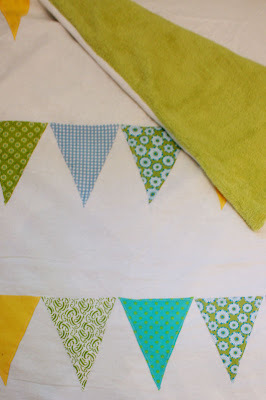 My future babies will definitely need bunting blankets. :) And how awesome of your mom and sister to help out! Sooo Cute! I'm also super impatient. I briefly thought about how cute these blankets would be in a twin size but I think all those triangles would make me lose my mind. So you're back to a boy and a girl now? Not two boys anymore? They are sooooo cute! I'm so anxious for you guys! Ooh those are fabulous! I love these way they look in those white cribs. I would love to link to this if you didn't mind. Those are so precious! I can't wait to see the whole room when the finishing touches are done! Very creative! This makes me feel like going out and sewing something and I haven't sewed in so long! These are so adorable! I love that you used a premade blanket for the fleece, what a great idea. I'm sure they were time consuming, but they really turned out so nice - not too masculine and not too feminine in style. That is truly a labor of love! Congrats on your upcoming arrival, we can't wait for details! Thanks everyone! Tiffannie - our agency was wrong about the two boys, and we received our referral about 2 weeks ago for a boy and girl! Rachel - You are more than welcome to link! Thanks! That is some of the most beautiful baby bedding I've ever seen! Love them! And I'm so glad I found you through One Pretty Thing...we're adopting from Ethiopia too! I was confused when I stopped by your blog...hey, have I been here before, yes, but why don't I recognize it. Oh...looking great! Love the names and how you've renamed your blog. All the best! So cute and wonderfully simple! Britt, I adore the blankets you made! My daughter is now almost three but even now I would love for her to have a blanket similar to this. I think the best part is the help you had and the story behind the blankets! It makes them all the more beautiful and special. I only hope mine turns out as lovely! <3 Thank you for sharing!!! Ooh, so very cute and such a great way to make coordinating bedding for a little boy and girl. I love it! I love this idea. 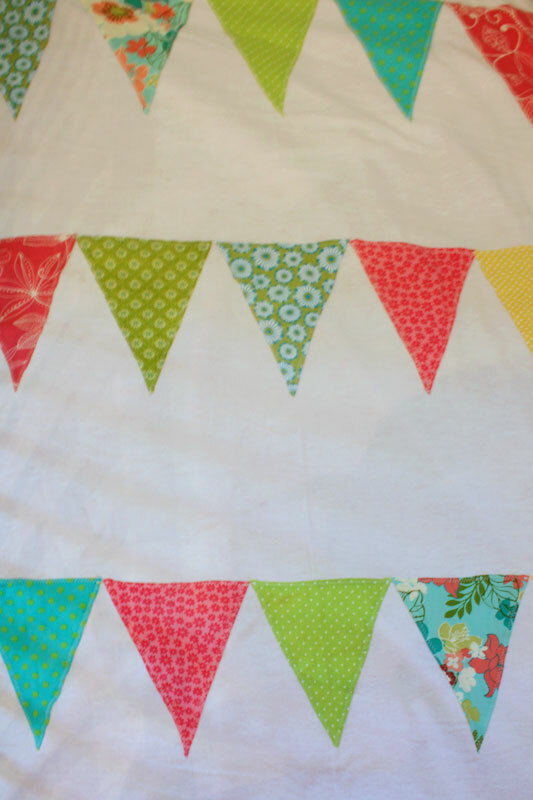 I'm using lots of scrap and vintage fabric in my soon-to-be-born daughter's room and this idea will let me tie all of it together. Thanks for the tutorial and sharing this awesome idea! Thank you so much for the tutorial. My mom & I made a blanket using it this weekend for my little Ethiopian baby's nursery!!! (waiting for a referral right now).